You are here: Home » Two Extreme Climates. One Tiny Backpack. What I Packed. When I see women traveling with backpacks larger than mine, sometimes I feel a flash of envy. What are they stashing in the extra space? More shoes? A hair dryer? Faced with the challenge of packing for a six-week trip to Hawaii and Alaska in a 40-liter backpack, I almost gave in to size envy and upgraded. I’m glad I didn’t. Despite the fact that my backpack was purchased for a nine-week Central American trip that required solely hot weather wear, the same reasons I originally selected it still trumped the enticement of another pair of shoes. First, a larger backpack would mean frequently being separated from it—checking it at airports, surrendering it during bus rides or airport taxis—and I’m kind of neurotic that way. I like arriving at my destination knowing I’ll have my clothes and other essentials in hand. With six flights on the Seattle-Hawaii-Alaska-Seattle itinerary alone, that would be six times a bag could go astray; and since we’re frequently in places for a short amount of time, often only a night or two, reuniting with an errant bag could be difficult. Second, being on the move so much means having to re-pack every few days. The less stuff, the shorter amount of time that chore takes. Third, the bigger the bag the heavier it is to tote around. With size envy squelched, I set about the task at hand: fitting the essentials (and yes, some indulgences) into a space that’s no bigger than a 1.5 square foot box. Clothes for this trip were geared primarily toward outdoor activities like hiking, glacier trekking, kayaking, and snorkeling. Anticipating that we would do laundry once a week, as during our Central American jaunt, here is what I took along. Except for the fleece jacket (either on or tied around my waist), hiking boots (worn while traveling from place to place), jewelry, sunglasses, and whatever outfit I had on, all this fits in a 40-liter backpack. Toiletries – the usual suspects, all of which fit into a quart-size zip lock bag; if I ran out of an item, such as body lotion, I purchased some, refilled the travel-size bottle, and used what I could of the rest before boarding the next flight. Hair straightener – my one true indulgence! It turns out that the island attire and the cold weather gear came in handy in both locales. A hair dryer. I would love to have traveled with my own hair dryer, but given the space constraints this was a fairly easy item to leave out. Most lodging places either provide them in rooms or have one available to borrow at the front desk. Traveling with a 40-liter backpack, even when packing for two extreme climates, doesn’t mean having to rough it. Obviously not everything can make the cut, but I hardly felt deprived (except for the hair dryer). Next up are extended travels through Europe, which means packing for about a year on the road. I’ll be making some wardrobe adjustments to fit more with museum-going than outdoor adventure, but I plan to keep the same 40-liter backpack and add a front pack. That extra pair of shoes might finally make the cut. I’ve seen Brian pack his bag, and one advantage that women do seem to have as far as clothes is that they’re smaller. Five of my shirts, for example, don’t take up nearly as much room as five of his. He doesn’t take a hair straightener, though! I could live with the amount of clothes and toiletries, but only one book? Thank god for the Kindle! No worries there! When I finished the current book I was reading I replaced it, either buying one or exchanging it on a free bookshelf. When we were cruising along the inside passage in Alaska, there was a bookshelf at one of the terminals. There was a copy of Margaret Atwood’s THE HANDMAID’S TALE, which I had never read and which kept me gripped for much of the day-long ferry ride. And Brian was actually carrying the e-reader in his backpack, so we did have more reading material available. We both read DARKLY DREAMING DEXTER on the e-reader on that trip. 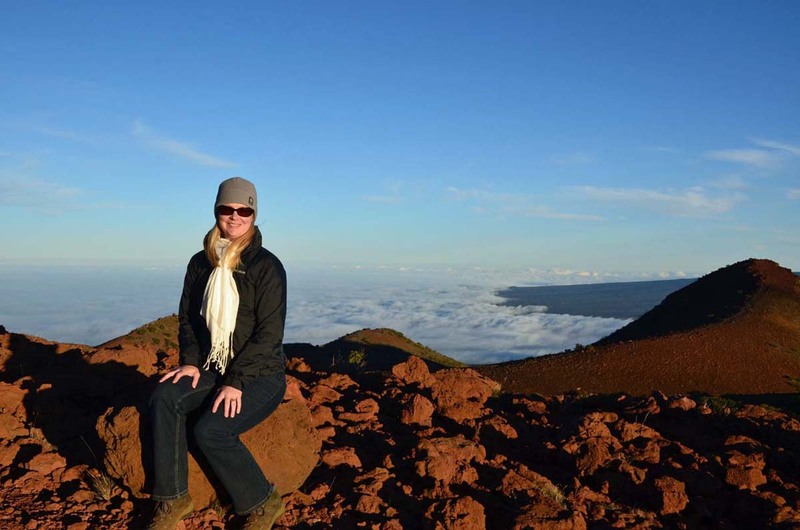 I was definitely grateful for the fleece and windbreaker while visiting Mauna Kea. I had no idea it would work out that way but am glad it did! Yup, and you still need a way to carry whatever you buy. I’m just living you my opinion, after being in about 55 or 60 different countries. Before was worst, I need the portable. Nowadays with the smartphone I carry everything in the pockets. Ok, sometimes a small handbag. I’m going Rostov next week, and I’m going in the way I tell you. It’s not only a matter of carrying, is mainly [for me] to pass controls fast and avoid waiting for any luggage at the airports. This actually raises a good point that perhaps I should have stressed more in the post. Everything I packed was well thought out ahead of time and geared toward the specific kind of travel we would be doing and the specific activities we had planned. I’m not big on shopping to begin with, and while I do like to do it occasionally in the different destinations we visit, I’d rather be visiting a museum or hiking to a hidden beach. Plus, women’s clothes can be tricky. For example, rarely do I find a pair of pants that fits “as is,” without needing to be hemmed. And then there’s the cost – it would quickly blow our travel budget to keep buying along the way on multi-week trips. I totally agree with you about not wanting to wait for luggage at airports – that’s why I stick with a modestly-sized backpack that fits under the seat in front of me on the plane. You don’t need to be big on shopping to buy a pair of jeans and a t-shirt here and there. In any case I give you my opinion [not trying ton convince you], and I really whish you a safe journey! I think what you’re perhaps not factoring in is the somewhat unique nature of the multi-month trip we took to Hawaii and Alaska. We can certainly see popping into a single destination or several similar ones where jeans and t-shirts are all that you need. But for the trip we took traveling the way you suggest would have limited what we could do. 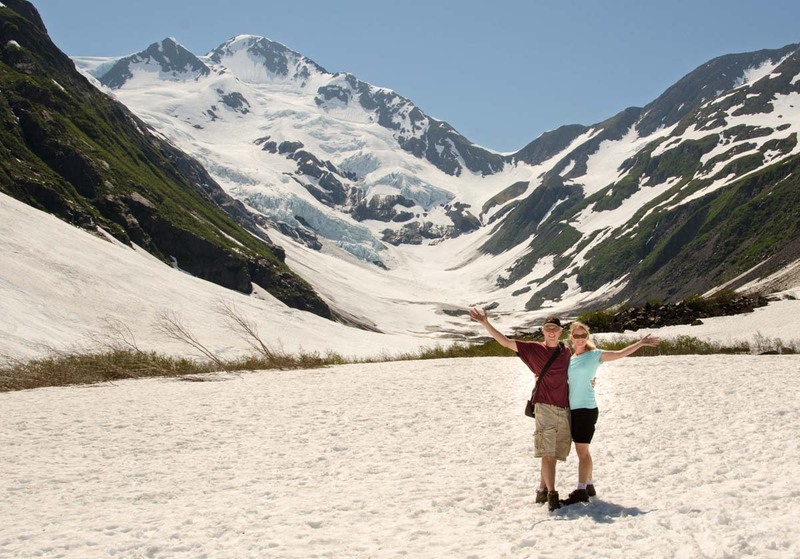 We needed good hiking boots – they were actually required equipment for glacier climbing. 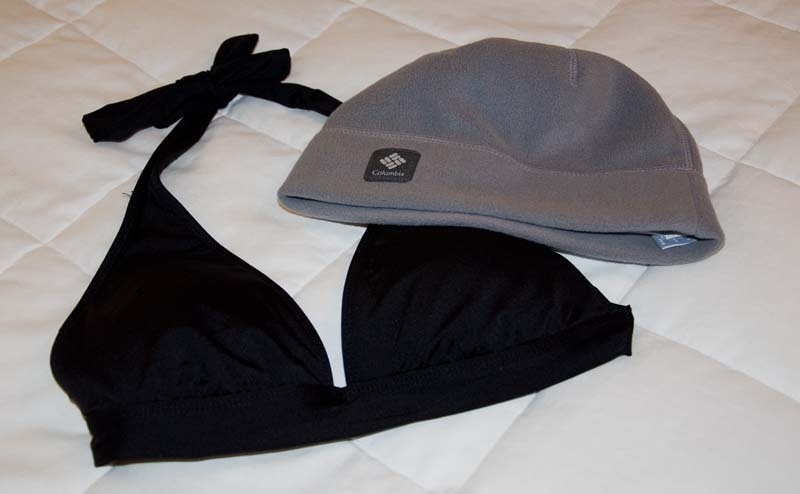 We needed warm, neoprene quick-dry clothing for kayaking in Alaska and bathing suits and shorts for Hawaii. We each carry laptops because we work from the road. We couldn’t have fit this stuff in our pockets. Buying it on location would have cost us each hundreds of dollars more than we needed to spend without necessarily getting the gear we wanted. And then we’d have had to ship the stuff somewhere because we wouldn’t have had a way to carry it. All that hassle and expense for what benefit? Meanwhile, we were still able to do all this with just carry-on bags. Practical and helpful hints from the well travelled Shannon. My contribution would be to recommend rolling items for packing, rather than simply folding; they seem to resist creasing that way, but that may be down to my illusion and conceit. Thanks for re-blogging! And that’s interesting about rolling items. Brian prefers that method, too, but I actually fold shirts and pants over in half and lay everything flat. Good job Shannon ! Im with digger on the rolling of clothes. I find they seem to fit better. Who knows. I usually use a bag I have that can be carried with handle and wheels or on the back. Small enough to fit in the overhead. I went on a 3 week tour in India a couple years ago. Small group. 8 of us. Travel in 2 small vans so they said please pack light. One girl had a suitcase about the size of a trunk ! only soft sided. She also had a carry on the size of my main bag. That big suitcase became a hassle even tho we were on a tour which of course makes things easier. I never could figure out what she had in there. She always seemed to be wearing the same few outfits daily just like the rest of us. LOL !!! I can’t even imagine toting around that big suitcase! Especially when she ended up wearing the same few outfits anyway. Some things I couldn’t do with the wardrobe I packed, like go out to a fancy restaurant, but that’s a tradeoff I’m more than okay with. And there have been a few shout outs for rolling clothes, so maybe I’ll give that another try! It has taken some refining over a couple of different extended backpacking trips, for sure. They were short compared to the length of time we’re going to be in Europe, so I’ll have to see how that unfolds. But it is surprising how much the 40-liter backpack will hold. Even a hair straightener! I’m very impressed with your packing prowess. My biggest challenge is contact lens solution. I finally found a brand that I can rinse and soak in, but finding little bottles can be difficult. It’s one of those must have items, so I usually end up carrying a pound of it. I did let go of the hair dryer, finally. Liquids of all kinds are a PITA because of TSA restrictions. We had six different flights on this trip and we were always being forced to throw out sunscreen and bug spray. So annoying. One possible solution for you, though, might be to wear glasses and leave the contact stuff at home. Just a thought. I am still working my down to a backpack that small! Every time I try to limit myself, I always end up with more than I planned. How long was the trip for? That trip was about two months long, which sounds really long for such a small bag. But the truth about packing is that if you bring enough stuff for a week, you have enough stuff for a month or an entire season. That’s true, but I always get sick of my clothes after a few weeks. So two months is a pretty good feat! I’ve stuck with my 55Liter backpack for three years now and while I think it’s fairly large, many women [and even men] are super impressed at how “light” I pack… Would love to eventually downgrade to a 45L! Been eyeing the north face’s Small duffel/backpack. Hawaii & Alaska in one trip sounds fantastic! !